Details Lead-tin orange is an artificial pigment made by heating lead and tin oxide together and is a reddish hue of lead-tin yellow (type I), which frequently occurs in European painting before the 18th century. There are, in fact, two types of lead-tin yellow, designated as types I and II. Type I is lead-tin oxide and is most frequently found on old paintings. Type II is a second variety of lead-tin oxide that may contain free tin oxide and additional silicon. Lead-tin yellow (type I) is prepared by heating a mixture of lead and tin dioxides to a temperature of about 800° C. Warmer hues of yellow appear at lower temperatures and at about 700–800° C., the more reddish-colored hues develop. Lead-tin orange is not affected by light and is stable under normal atmosphere. Due to the presence of lead it may darken by atmospheric hydrogen sulfide and is therefore more permanent in oil than in watercolor. On paintings, lead-tin yellow (type I) has been found mixed with lead white, vermilion, yellow lakes, ochres, verdigris, indigo and azurite. 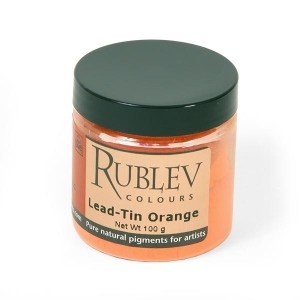 Lead-tin orange absorbs a small amount of oil (16 g oil per 100 g of pigment). It has a strong drying effect on oil paint. 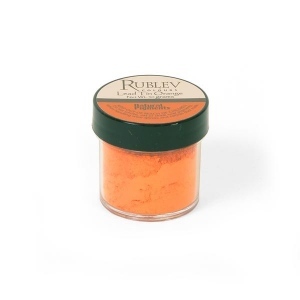 Lead-tin orange contains lead and is rated highly toxic, especially with prolonged ingestion or inhalation. Utmost care should be used in handling the dry powder pigment to avoid breathing the dust. It is only moderately toxic in contact with the skin.